The A' Food, Beverage and Culinary Arts Design Competition is a unique design competition open to submission of foodstuff, beverages and culinary objects designed by food & beverage professionals and producers worldwide. The A' Design Award for Food, Beverage and Culinary Arts is not just an award, it is the indicator of quality and perfection in design and taste, the award is recognized worldwide and takes the attention of design oriented companies, professionals and interest groups. Winning the A' Award is a certificate of excellence for producers. Having the A' Award attracts the eyes of design oriented gourmets worldwide, winners will be able to find better and higher profile sales leads. 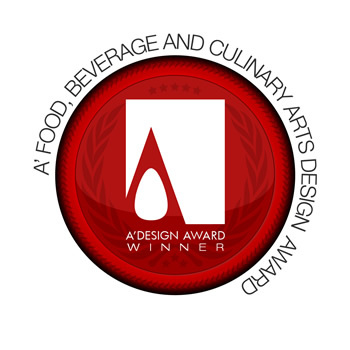 The winners of the A' Food, Beverage and Culinary Arts Design Award are provided extensive and exclusive marketing and communication services to promote the success of winning the A' Award. Furthermore, the winning designs appear on the A' best designs book which is available worldwide, this book is furthermore distributed to the high-profile magazine editors, design oriented companies and relevant parties. The winning designs are also exhibited at our exhibition. The winners appear on magazines, newspapers, webzines and many other publishing mediums. The Jury is composed of both a focus group of end-users and gourmets that will taste your offering. The Aim of the Food, Beverage and Culinary Arts Design Award is to attract the attention of media and design oriented gourmets and culinary writers to your business by means of creating publicity and dissemination and also to separate you from the rest of the actors in the food and beverage industry by honoring your institution with a prestigious award. To be eligible for this award, you should be a representative / manager or owner of an enterprise or business in Hospitality, Tourism or Travel sectors. Only a single entry per sub category is allowed each year. The Food, Beverage and Culinary Arts award considers your entry on multiple aspects, furthermore different than other categories, submissions to this category should also be physical as the products will also be checked by gourmets. We are also expecting you to present us a representative image of your offering. The recipe of the food or beverage should never be submitted but ingredients list (without the proportions) can be provided. Packaging of the item, if any should also be provided. The A' Food, Beverage and Culinary Arts Design entries are judged by our criteria that checks four main key points: 1. Taste Originality: Does your offering have a unique / individual or distinctive taste. 2. Presentation or Packaging: Is your offering presented or packaged in a professional way. 3. Innovation Content: What makes your offering unique. 4. Social Responsibility: Sensivity to health, heritage, sustainability and environment. Shortlisted entrants (with approved entries) are required to send a physical submission of their product (i.e. for industrially produced products only) to A' Design Award and Competitions, to be tasted by a focus group and gourmets. Physical submissions should be sent to: OMC D.S. A' Design Award & Competition, Via Rodari 9, 22100, Italy. Award winners will be able to use a title that matches their nomination category: Such as "Culinary Design Award Winner". Physical Submission Up to 5 kg. UPS The physical submission of the or food items. Please note that edible submissions will be tasted and consumed. Physical submissions should be sent to: OMC D.S. A' Design Award & Competition, Via Rodari 9, 22100, Italy.